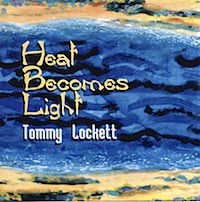 Heat Becomes Light was my first album for Heat Records. I produced,engineered and mixed it at my old Silver Lake Studio in Los Angeles. I composed all the songs and was blessed with getting my friend Jamie Glaser to play guitar. Jamie had just come off the road with the Manhattan Transfer, and was a very in demand session guitarist in Los Angeles. Jamie would come in, hear the music, and make it his own. Also appearing on the album is my long time Berklee school buddy Frank Macchia. Frank is perhaps the best composer, orchestrator, arranger that I have ever known, and I have worked with some of the best. The drum chair was shared by Ed Smith and Ray Frisbie, both of whom make any track sound good.